After decades of dictatorship and two years of arguments and compromises, Tunisians finally have a new constitution laying the foundations for a new democracy. The document is groundbreaking as one of the most progressive constitutions in the Arab world — and for the fact that it got written at all. It passed late Sunday by 200 votes out of 216 in the Muslim Mediterranean country that inspired uprisings across the region after overthrowing a dictator in 2011. "This constitution, without being perfect, is one of consensus," assembly speaker Mustapha Ben Jaafar said after the vote. "We had today a new rendezvous with history to build a democracy founded on rights and equality." The constitution enshrining freedom of religion and women's rights took two years to finish. During that period, the country was battered by high unemployment, protests, terrorist attacks, political assassinations and politicians who seemed more interested in posturing than finishing the charter. At the same time, Egypt wrote two constitutions. Egypt's charters were quickly drafted by appointed committees and involved little public debate or input. In Tunisia, an elected assembly of Islamists, leftists and liberals worked on a detailed roadmap for their political future. Tunisians hope its care in drafting the constitution makes a difference in returning stability to the country and reassuring investors and allies such as the US. "We needed time to get this constitution as it is today," said Amira Yahyaoui, who has closely followed the assembly's activities with her monitoring group Bawsala. "Clearly, writing this constitution to do a real transformation of the minds of people needed time and I absolutely don't regret these two years and I am happy we had time to discuss and think about all the arguments." The new constitution sets out to make the North African country of 11 million people a democracy, with a civil state whose laws are not based on Islamic law, unlike many other Arab constitutions. An entire chapter of the document, some 28 articles, is dedicated to protecting citizens' rights, including protection from torture, the right to due process, and freedom of worship. It guarantees equality between men and women before the law and the state commits itself to protecting women's rights. "This is the real revolution, many democratic constitutions don't even have that," said Yahyaoui. "It will have a real impact on the rest of the Arab region, because finally we can say that women's rights are not a Western concept only, but also exist in Tunisia." Tunisia has always had the most progressive legislation on women's rights in the Arab world and Yahyaoui believes the long period of writing has made people comfortable with its contents. One of the most hotly debated articles guarantees "freedom of belief and conscience," which would permit atheism and the practice of non-Abrahamic religions frowned upon in other Islamic countries. It also bans incitement to violence and declaring a Muslim an apostate — a fallen Muslim — which leaves them open to death threats. In response, conservative lawmakers insisted that "attacks on the sacred" be forbidden, which many see as a threat to freedom of expression. "This formulation is vague and gives too much leeway to the legislators to trample other rights such as the right to free expression, artistic creation and academic freedoms," warned Amna Guelleli, the Human Rights Watch representative in Tunisia. "However, the risk is reduced given the strong safeguards (in other articles) against overly broad interpretations." Since the revolution, there has been a rise in convictions for so-called attacks on religion, especially by artists. A Tunisian cartoonist is in the second year of a seven-year sentence for posting cartoons insulting to the Prophet Muhammad on Facebook. Constitutional scholar Slim Loghmani said despite some drawbacks, the constitution is an "historic compromise between identity and modernity" that can serve as a model for other countries in the region seeking a balance between an Arab-Islamic heritage and contemporary ideas of human rights and good governance. "It's a step forward in the nagging question of cultural identity in Arab countries," he said, lauding in particular not just freedom of religion but what he calls the freedom "not to have a religion." While the constitution itself will not solve the country's persistent unemployment, rising prices, crushing debt and constant demonstrations, Loghmani said it will move politics forward and reassure foreign investors that the country is back on track after a rocky transition. "It will be a relief for the average Tunisian who is impatient to see the end of the transition period," he said. "It will reassure Tunisia's international partners that the country is headed in the right direction." The completion of the constitution is also a tribute to the assembly's disparate parties to compromise and negotiate to reach a consensus. In the end, Ennahda made concessions to the opposition and stepped down in favour of a caretaker government to manage the rest of the transition, allowing the constitution to be completed. The willingness of Ennahda to negotiate stood in sharp contrast to the more overbearing approach of the Muslim Brotherhood in Egypt, which had a more dominant position in the elected parliament and held the presidency. It ran roughshod over the demands of the opposition, citing its electoral successes. "Egyptian constitutional politics has been a winner-take-all game; Tunisian politics has been more consensual — though consensus has been difficult to achieve," said Nathan Brown, an expert on Egyptian law at George Washington University. 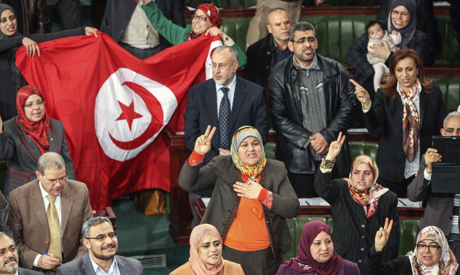 "The Tunisian experience is one that is more likely to give birth to a functioning democracy." The overthrow of the Muslim Brotherhood government in Egypt by the military in July amid mass protests against its rule and subsequent violent repression was a stern warning to Tunisia, said Yahyaoui of Bawsala, and it helped the various parties find a compromise. "The only people who won something out of what happened in Egypt was Tunisia," she said. "Ennahda saw what happened to the Brotherhood and they didn't want to see the same scenario in Tunisia." To all those who claim that Egyptians have no sense of compromise: Do you folks remember who initiated this culture? Yes, you guessed it right, the Ikwan. They were the ones failing to compromise with the opposition, claiming that their victories legitimate them to rule the country and force their policy, at the same time rule out any sort of compromise with oppositions. They were the zenith of the arrogance... Enhada in Tunisia, is the same as the Ikwan in Egypt but were much smarter. Although they had won all the elections, they stepped down and agreed for a consensus with the oppositions. Egypt has much to learn from Tunisia. No one has been excluded from the political process there. No massacres, no civil war, No rabaa, no interference by the army. Frankly, the Egyptians are ignorant and stupied, The culture of compromise doesn't exist in Egypt.